Dr. Lynn Oxborrow is a Principal Lecturer in Small Business and Supply Chain Management at Nottingham Trent University. Her research interests focus on clothing industry supply chains and creative industry clusters. 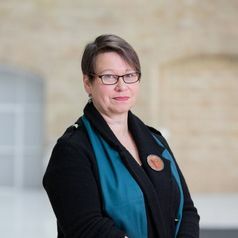 As project manager and lead co-investigator on a Defra funded project Strategies to Improve Design and Testing for Clothing Longevity, Lynn’s role focused on the commercial aspects, such as sustainable business model and supply chain organisation, which are often limiting factors. She is also co-investigator on an NTU funded project to research the business and community benefits of pop-up retail formats, focusing on stakeholder interests and the benefits to small traders. Lynn is a member of NTU’s Entrepreneurship and Innovation Research Group. She is actively engaged in ERDF projects in Derbyshire and Nottinghamshire to encourage innovation and growth, working directly with local small and medium sized businesses, and business facing organisations. Her speciality is in support for fashion, retail and creative industry businesses.